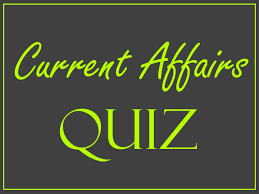 Current Affairs quizzes provided in this article are very important for IAS Prelims Exam 2017. The given IAS questions have been created on the same pattern of IAS Exam syllabus. The IAS aspirants must go through such IAS questions during IAS preparation. IAS aspirants must do the practice of current affairs IAS questions during IAS Exam preparation. The practice of IAS questions will help IAS aspirants to gain momentum during IAS preparation. Here, in this article, we have provided current affairs IAS questions quite essential for IAS Prelims Exam 2017 preparation. I. The Cartosat-2 series satellite is the primary satellite carried by PSLV-C34 and it has been injection into GEO- Synchronous Orbit. II. The Cartosat-2 series satellite will begin providing regular remote sensing services. III. The imagery of Cartosat-2 series satellite will be useful cartographic applications, urban and rural applications, coastal land use and regulation, utility management. Launch of PSLV-C37/Cartosat-2 Series Satellite Mission took place on from SDSC SHAR, Sriharikota. The Cartosat-2 series satellite is the primary satellite carried by PSLV-C37. This satellite is similar to the earlier Cartosat-2, 2A and 2B. After its injection into polar Sun Synchronous Orbit by PSLV-C37, the satellite was brought to operational configuration following which it will begin providing regular remote sensing services using Panchromatic and Multi-spectral cameras. I. FLRP has been established by International Center for Agricultural Research in Dry Areas (ICARDA). II. The Cabinet has authorised the Ministry of Science and Technology to carry out technical modifications in the Supplementary Agreement signed between ICAR and ICARDA relating to establishment of FLRP. III. The establishment of FLRP in India will enable India to harness the best of international science in meeting the emerging food security challenges. The Union Cabinet has approved the Establishment of Food Legumes Research Platform (FLRP) at Amlaha, Sehore, Madhya Pradesh with Satellite Hubs in West Bengal (for pulses) and Rajasthan (for Natural Resource Management) by ICARDA in the second phase; by International Center for Agricultural Research in Dry Areas (ICARDA) and authorised the Ministry of Agriculture to carry out technical modifications in the Supplementary Agreement signed between ICAR and ICARDA relating to establishment of FLRP, if required. The establishment of FLRP in India will enable India to harness the best of international science in meeting the emerging food security challenges. India would be able to rapidly and effectively absorb the research output achieved in the country by FLRP. A major international R&D institution will make India an even bigger center for agricultural research in the world and this in turn, will attract further research & development investment in the country. This is a research set up by an international organization. ICARDA has a good track record of innovation, as in climate resilient technologies including suitable food legume varieties for dry-land production systems. ICARDA will carry out research through a multi-disciplinary team of scientists for enhancing productivity of crops range-land and livestock. This platform will contribute significantly towards reducing poverty, improving food security, improving nutrition and health, and sustaining the natural resource base. The research output would benefit farmers of all regions, whether big, small or marginal; and as technologies developed would be eligible for use by all farmers, the project is equitable and inclusive. I. Pandit Deendayal Upadhyay Unnat Krishi Shiksha Scheme was launched in the year 2016 to promote agricultural education under which 100 centres are being opened with a fund of Rs.5.35 crore. II. Under Pandit Deendayal Upadhyay Unnat Krishi Shiksha Scheme, the central government will provide the education to the agriculture graduates. Under Pandit Deendayal Upadhyay Unnat Krishi Shiksha (PDUUKS) Scheme the central government has opened 100 centres to promote agriculture education in the country. The Union Agriculture and Farmers Welfare Ministry has this information regarding opening up of new centres in the country. Under the scheme the central government will provide the education to the agriculture graduates. From the year 2016-17, scholarship to the students has been increased from Rs 1000 to Rs 3000. Four new colleges have been opened in Rani Laxmibai Central Agricultural University, Jhansi, Bundelkhand, out of which 2 are in Uttar Pradesh and 2 Colleges are in Madhya Pradesh. IARI-Jharkhand has been established and students of the state are studying in various courses under Pandit Deendayal Upadhyay Unnat Krishi Shiksha Scheme. 4. Over which of the following lakes, India’s first first-ever floating elementary school was has been inaugurated recently? India’s first floating elementary school named Loktak Elementary Floating School has been inaugurated recently at Langolsabi Leikai of Champu Khangpok floating village on Loktak Lake in Manipur. The school was established to control the sudden high dropout rate of children living in the Champu Khangpok floating villages who were rendered homeless due to the recent evacuation of phumdis. Loktak Lake is referred as the lifeline of Manipur, the largest freshwater lake in northeast India. It is also famous for the phumdis or phumshongs, the assorted heap of vegetation, soil and organic matter at various stages of decomposition floating over it. I. The International Intellectual Property Index 2017 titled ‘The Roots of Innovation’ revealed that though India showed slight improvement its performance, still it continued to lag behind the rest of the world in IP protections. II. Out of a total of 35 points, India could score only 8.75, even below the average score of 15.39. III. The Index has been topped by United States with a score of 32.6. The Annual International Intellectual Property Index released by US Chambers of Commerce’s Global Intellectual Property Centre (GIPC), India has been ranked very poor at 43rd position out of 45 countries. The International Intellectual Property Index 2017 titled ‘The Roots of Innovation’ revealed that though India showed slight improvement its performance, still it continued to lag behind the rest of the world in IP protections. Out of a total of 35 points, India could score only 8.75, even below the average score of 15.39.The Index has been topped by United States with a score of 32.6 followed by UK, Germany, Japan and Sweden.